Hemel 24: Rugged or refined? Home / News / Hemel 24: Rugged or refined? When it comes to affordable watches, some people focus on crowdfunding websites to find their next watch, while there are a lot of watches out there from established microbrands. One of those brands is Hemel. This US based brand makes military-inspired watches. As cool as this may sound, many people forget that military watches, in general, where never the most refined pieces. After all, nobody really cares when the bullets started flying, and secondly, it is tax-payers money, so they had to be relatively inexpensive. Hemel combined the two and created a refined, military-inspired watch, called the 24. The main attraction of the watch is the case. It is very well rounded, and this works especially good in combination with the classic black military dial and the vintage inspired hands. 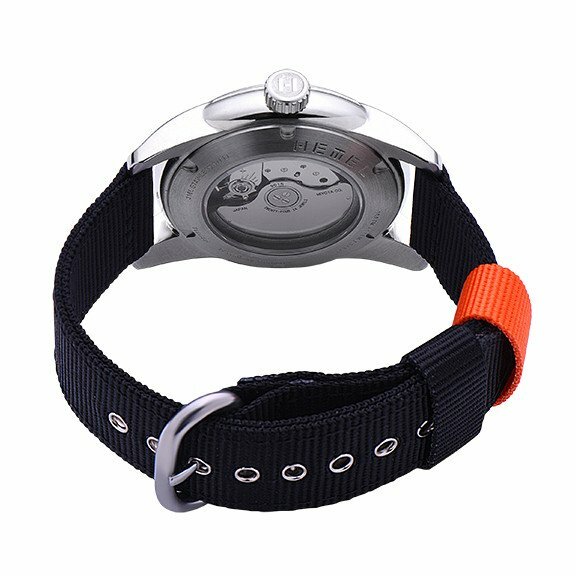 The case is 40mm in diameter, and Hemel gives you the option if you want it polished or bead-blasted. This is, in fact, larger than the classical military watches, but fortunately much smaller than most of the homage pieces we see out there these days. I would call the size contemporary, because it makes the watch look good, even when you wear a suit, and functional when you take it in the outdoors. You can easily read the time, but the watch is not so big that it feels cumbersome or that it limits movement. The Hemel 24 can take a beating because in the front it is fitted with a domed sapphire crystal, while the back has a flat sapphire crystal. Behind it, you can see Miyota Caliber 9015, a good choice, especially for a military-inspired watch, since you can manually wind it and it has a hacking second. 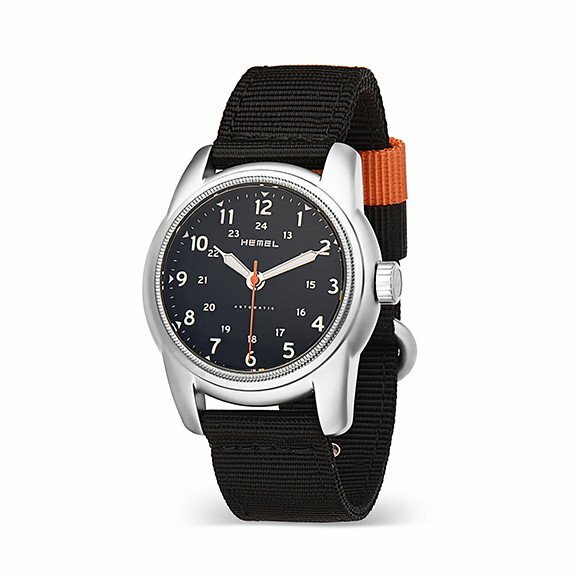 While NATO-straps seems to be everybody’s favorite these days, the Hemel 24 is fitted with a two-piece nylon strap, that is secured with a buckle. It looks better, and more importantly, it also doesn’t obstruct the view of the movement through the sapphire case back. Hemel asks US$399,99 for the “24” and given the build quality that is a price in line with many Kickstarter projects, but more so, for that money you get a watch that is rugged as well as refined, and there aren’t that many around that can say that!